NEWARK, N.J. — Sam Reinhart dashed toward the blue line, braced for Rasmus Dahlin's shot and fell to the ice when the puck struck him. Dahlin quickly skated over to check on Reinhart, who stood up and skated to center ice before the Buffalo Sabres concluded a fast-paced practice Sunday in Prudential Center. 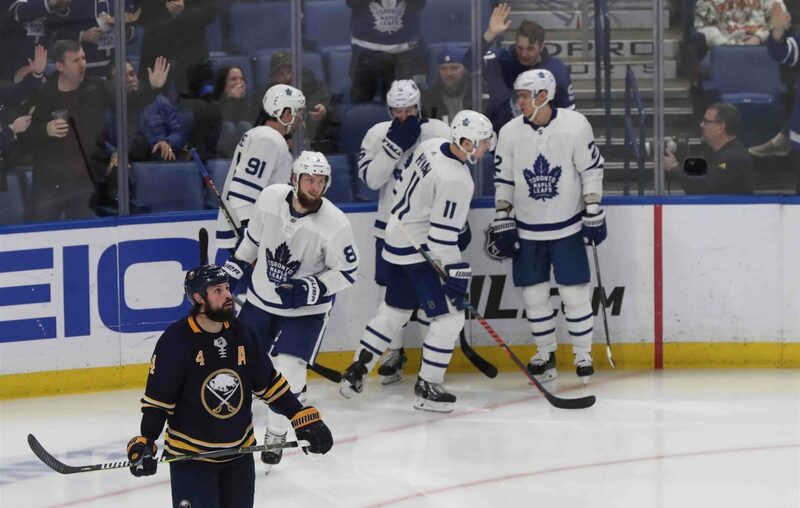 Their playoff hopes ended with a 7-4 loss in Montreal one night earlier, yet the Sabres feel there is much to play for over their final eight games, beginning Monday night against the New Jersey Devils. The situation can be challenging for a team that had played for one singular goal since the onset of training camp. While they will eventually reflect on the Sabres' collapse following a 10-game win streak, their motivation has shifted now that the franchise's playoff drought reached eight years. "You always have something to play for," Carter Hutton said. "It’s the NHL. Truthfully, for me, I clawed and fought my whole career to make it here, so every time you get a chance to play in the NHL, it’s an honor. You should never take it for granted. ... When you’re out of the playoffs it’s tricky but everyone is playing for a job. Everyone is playing for their life. That’s something guys need to be aware of for sure." They also are trying to discover how their play rapidly deteriorated following a one-day stint atop the NHL standings. Since winning their 10th consecutive game Nov. 27, the Sabres are tied with the Ottawa Senators for the fewest points (35) while scoring the fifth-fewest goals and allowing the third most. Additionally, the Sabres are just 11-21-5 away from KeyBank Center and have lost 11 straight, going 0-9-2 since their 5-4 win in Columbus on Jan. 29. Only two NHL teams have performed worse on the road: Ottawa and New Jersey. The Sabres' collapse is dotted with troubling trends. They have allowed 93 second-period goals this season, which ranks 29th in the league, and their minus-29 differential in the period ranks 30th. They have not won back-to-back games since Dec. 13, and one goal against tends to snowball. Coach Phil Housley wants to address their 5-on-5 struggles over the season's final two weeks. The Sabres have a negative-30 goal differential in those situations since the winning streak, compared to plus-5 in their first 25 games. Entering Sunday's games, every team occupying a playoff spot had a positive goal differential at 5-on-5. "It’s so important," Housley said. "If you look at every team that’s in playoff position right now, their 5-on-5 is on the plus side, so that’s what we need to focus on. The games we’ve had success we’ve been on the right side of that, and we haven’t had a lot of success, so those are some of the areas we need to focus on. What does that mean? That means playing well without the puck. When we don’t have it, we have to have an urgency without it." Housley pointed to youth as a reason for the Sabres' ugly defensive performance Saturday in Montreal; however, many of their errors were committed by players with a wealth of NHL experience, including Reinhart and Jack Eichel. The team is allowing too many scoring chances, while making the opposing goalie's job easy. Prior to practice Sunday, the Sabres' coaches illustrated that fact by showing players video of traffic in front of Hutton compared to that in front of Montreal's Carey Price. The difference was remarkable. Sabres rookie center Casey Mittelstadt could be a healthy scratch Monday, as Housley tries to reinforce the importance of defensive awareness, yet it's a team-wide issue. "I think we just have to give up less," Hutton said. "We give up a lot of high-quality chances that end up in our net sometimes. Managing the emotions of the game. Lately we’ll play well, we give one up and all of a sudden it snowballs on us. We can’t seem to make those plays. It’s little mistakes, too. Not getting pucks out, losing blue lines and good teams make you pay. For us, the urgency has to be getting to the other team’s net and making it harder on other goalies." Still, Kyle Okposo doesn't buy the notion that a non-playoff team can build momentum toward the following season since change is inevitable. Players will be added and subtracted. Systems can change. A different message is typically delivered during the offseason. The 31-year-old winger thinks the Sabres should play well, regardless if the playoffs are within reach. No amount of success will absolve the Sabres of their historic fall, Okposo said. They are one of only two teams in NHL history to miss the playoffs in the same season in which they won 10 games in a row, and no one is sure how they continue to make the same mistakes. For now, they intend to focus on the season's 13 days before a long offseason of reflection. "There has definitely been progress off the ice," Okposo said. "I think that last year there was no way we would have been able to win 10 games in a row or have the start that we did. The first two and a half months of the season were really, really big steps. I don’t think we can forget that. That’s not easy to do in this league. … We’re going to have to look in the offseason to see what we can do better. See why we seemed to run out of steam in the second half of the year. There are going to be a lot of different conversations and a lot of reasoning to try to figure out what happened."